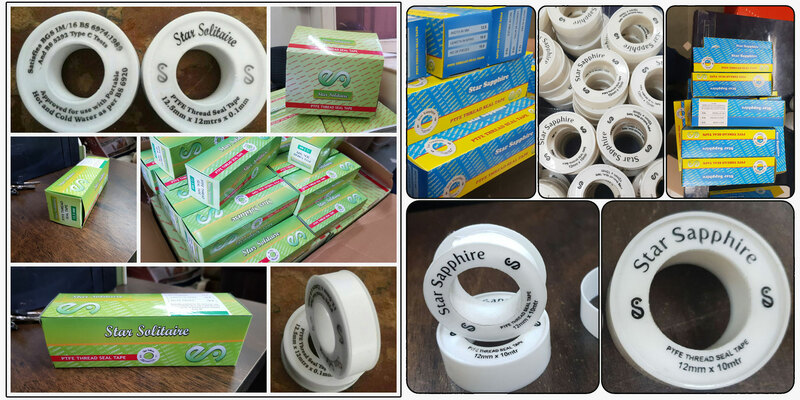 PTFE Thread Seal Tapes are white, NOIA, adhesive PTFE Thread Seal Tapes produced from pure Poly tetra fluoro ethylene (PTFE) Generally you can say about PTFE Thread Seal Tape that the higher density (g/cm.3) the better product, that means more flexibility and improved diffusion seal capability, and In addition, it makes the tape easier to work with and more economic in use. Star Solitaire is recommended for natural gas, liquid oxygen, and use with Hot & Cold Water. PTFE Thread Seal Tape is used for sealing threaded joints. It is widely used in water plants, cooling and steam system, system of compress air etc. It is also very much useful in hygiene oriented places like hospitals. The exceptional strength and high molecular weight of the fibre-fluorine compound provides PTFE Thread Seal Tape series of outstanding qualities. Temperature proofed from, -200oc to +260oC resistant to almost all types of add, bases, solvents, chemicals, etc, however, with the exception, of fluorine some fluoride chemicals and melted alkali metals, very low In, coefficient of friction,. PTFE is non-Ageing inflammable. It has high tensile strength even, at low temperatures. Sound electric Insulating power independent of frequency and temperature. PTFE Is rather bad resistant to gamma radiation.